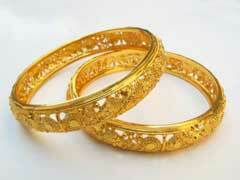 Best Place To Sell Gold Jewelry Online – What Are My Options? 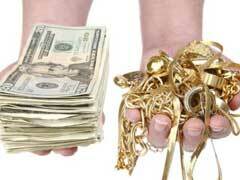 Every day millions of Americans are bombarded by sell gold jewelry for cash TV and radio infomercials. Moreover, it seems like anywhere you go, you run into a sell gold jewelry booth or a kiosk in a mall or even your local grocery store. 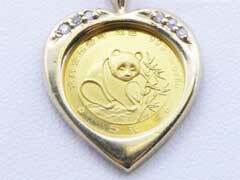 However, it does not stop people from searching the best place to sell gold jewelry for a maximum return. 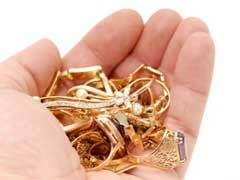 How to Sell Gold Jewelry For Cash and Avoid Hassle? All of us own a pair of gold earrings or a piece of gold jewelry that are perhaps not our favorite or simply got out of fashion. Finding places where you can safely sell gold jewelry for cash is never easy. Anyone who wishes to sell precious metal jewelry is faced with a dilemma of finding the best online place to sell gold jewelry for cash. That is not easy in these tough economic times since the market is flooded with online gold scams and irresponsible dealers. 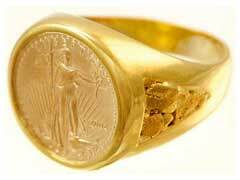 Gold Coin Rings – Investment or Souvenirs? In ancient times, gold coin rings were symbols of wealth and prosperity and were often worn with pride to symbolize membership in a certain brotherhood or society. Throughout the history of gold, gold coins were thought to hold a superior power in all business transactions and were readily preferred over paper money that could be easily forged and were prone to considerable wear and tear. For the last few years gold has seen incredible jumps in price stimulating public’s interest in all sorts of things having to do with this yellow precious metal. Are all gold things created equal and should you spend your hard earned cash on coins mounted on pendants?